High Wear, High Temperature, Self-Leveling/Restoration, Chemical Resistant, UV Stable or Fast Cure whatever your need we have solutions. We offer options including thin mil coatings, self-leveling epoxy, power trowel applied epoxies, urethane cement, urethanes including aliphatic, polyurea, and polyaspartic resins to customize a system to your particular application. 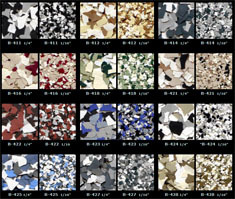 Decorative options including decorative flake, decorative quartz, and metallic our systems offer exceptional durability and long lasting finish. Each one no matter if composed of epoxy, urethane, or polyaspartic will create a vibrant, seamless, UV stable finish. We offer several textures and glosses to give you the look and slip resistance your looking for perfect for bathrooms, locker rooms, break rooms, offices, hallways, and entries. Polished concrete is concrete that has been processed through a series of grinding steps using progressively finer abrasives. This process also includes the use of a penetrate chemical known as a hardener. The concrete densifier/hardener penetrates into the concrete and creates a chemical reaction to help harden and dust proof the surface. Polished Concrete is a "Green" flooring system and LEED approved. Dyes designed for concrete polishing are often applied to add color to polished concrete as well as other options such as scoring, saw cut lines, bands, borders, and other designs. For companies looking for a customized installation to make and impact on customers and employees such as a logo or to lines to designate walkways, aisles, or compliance with OSHA, 5S, or company safety standards. We can apply various line widths including 2", 4" and 6" traffic lines or colored walkways to guide traffic, organize warehouses, and protect pedestrians. 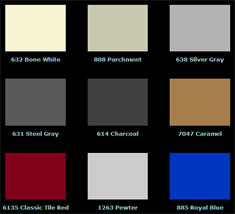 Available in any of our standard colors or in custom colors such as safety yellow, orange, red, blue, and safety green.